Louis was born in Bourges on 3 July 1423, the son of King Charles VII of France. At the time of the Hundred Years War, the English held northern France, including the city of Paris, and Charles VII was restricted to the centre and south of the country. Louis was the grandson of Yolande of Aragon, who was a force in the royal family for driving the English out of France, which was at a low point in its struggles. 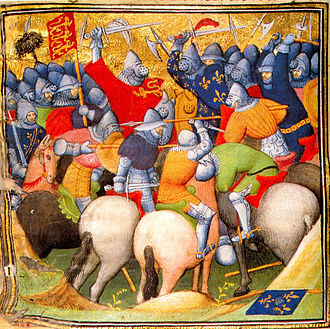 Just a few weeks after Louis's christening at the Cathedral of St. Étienne on 4 July 1423, the French army suffered a crushing defeat by the English at Cravant. Shortly thereafter, a combined Anglo-Burgundian army threatened Bourges itself. 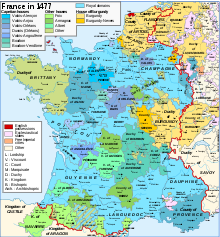 During the reign of Louis's grandfather Charles VI (1380–1422), the Duchy of Burgundy was very much connected with the French throne, but because the central government lacked any real power, all the duchies of France tended to act independently. Duke Philip II ("The Bold") was the reigning Duke of Burgundy while he was king. Philip was an uncle of King Charles VI, and he actually served on a council of regents for King Charles. The Dukes of Anjou, Berry, and Bourbon, all uncles of Charles VI, also served on this council of regents. All effective power in France actually lay with this council of dukes. In its position of independence from the French throne, Burgundy had grown in size and power. By the reign of Louis's father Charles VII, Philip III ("the Good") was reigning as Duke of Burgundy, and the duchy had expanded its borders to include all the territory in France from the North Sea in the north to the Jura Mountains in the south and from the Somme River in the west to the Moselle River in the east. 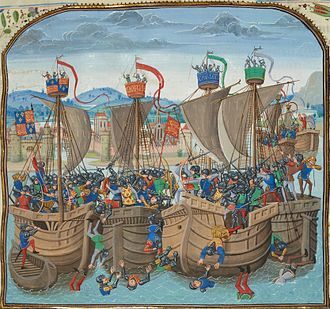 During the Hundred Years War, the Burgundians allied themselves with England against the French crown. Indeed, the Burgundians were responsible for the capture of Joan of Arc and her execution on 31 May 1431. In 1429, young Louis found himself at Loches in the presence of Joan of Arc, fresh from her first victory over the English at the Siege of Orléans, which initiated a turning point for the French in the Hundred Years War. 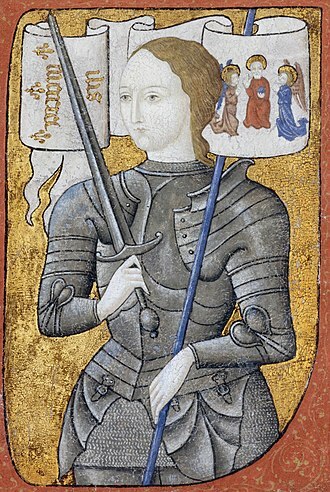 Joan later led troops in other victories at the Battle of Jargeau and the Battle of Patay. Although Joan was unable to liberate Paris during her lifetime, the city was liberated after her death, and Louis and his father Charles VII were able to ride in triumph into the city on 12 November 1437. Nevertheless, Louis grew up aware of the continuing weakness of the French nation. He regarded his father as a weakling, and despised him for this. On 24 June 1436, Louis met Margaret of Scotland, daughter of King James I of Scotland, the bride his father had chosen for diplomatic reasons. There are no direct accounts from Louis or his young bride of their first impressions of each other, and it is mere speculation whether they actually had negative feelings for each other. Several historians think that Louis had a predetermined attitude to hate his wife. But it is universally agreed that Louis entered the ceremony and the marriage itself dutifully, as evidenced by his formal embrace of Margaret upon their first meeting. Louis's marriage with Margaret resulted from the nature of medieval royal diplomacy and the precarious position of the French monarchy at the time. 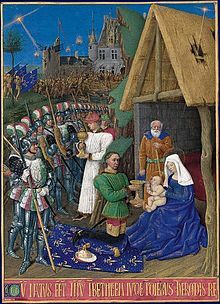 The wedding ceremony—very plain by the standards of the time—took place in the chapel of the castle of Tours on the afternoon of 25 June 1436, and was presided over by Renaud of Chartres, the Archbishop of Reims. The 13-year-old Louis clearly looked more mature than his 11-year-old bride, who was said to resemble a beautiful doll, and was treated as such by her in-laws. Charles wore "grey riding pants" and "did not even bother to remove his spurs". The Scottish guests were quickly hustled out after the wedding reception, as the French royal court was quite impoverished at this time. They simply could not afford an extravagant ceremony or to host their Scottish guests for any longer than they did. The Scots, however, saw this behaviour as an insult to their small, but proud, country. Following the ceremony, "doctors advised against consummation" because of the relative immaturity of the bride and bridegroom. Margaret continued her studies, and Louis went on tour with Charles to loyal areas of the kingdom. Even at this time, Charles was taken aback by the intelligence and temper of his son. During this tour, Louis was named Dauphin of France by Charles, as was traditional for the eldest son of the king. The beautiful and cultured Margaret was popular at the court of France, but her marriage to Louis was not a happy one, in part because of his strained relations with her father-in-law, who was very attached to her. She died childless at the age of 20 in 1445. Like other strong-minded boys, he had found at last he could not carry all before him by mere bluster. Neither as prince nor as king did he ever forget his lesson. He never acted on pure impulse, without reflection, though to his life’s end he was constantly tempted to take such a risk. Louis continued soldiering. In 1444, he led an army of "écorcheurs" (bands of mercenary soldiers) against the Swiss at the Battle of St. Jakob an der Birs and was impressed by the latter's military might. He still quarreled with his father, however, and his objectionable scheming, which included disrespectful behavior directed against his father's beloved mistress Agnès Sorel, caused him to be ordered out of court on 27 September 1446 and sent to his own province of Dauphiné. 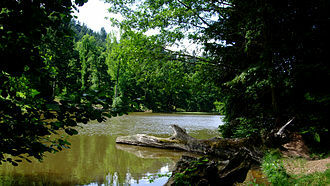 He lived mainly in Grenoble, in the tour de la Trésorerie. Despite frequent summons by the king, the two would never meet again. In Dauphiné, Louis ruled as king in all but name, continuing his intrigues against his father. On 14 February 1451, Louis, who had been widowed for six years, made a strategic marriage to the eight-year-old Charlotte of Savoy, without Charles' consent. This marriage was to have long-ranging effects on foreign policy as the beginning of French involvement in the affairs of the Italian peninsula. 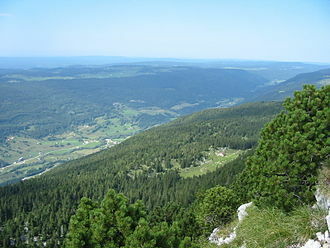 Finally, in August 1456, Charles sent an army to Dauphiné. Louis fled to Burgundy, where he was granted refuge by Duke Philip the Good and settled in the castle of Genappe. King Charles was furious when Philip refused to hand over Louis and warned the duke that he was "giving shelter to a fox who will eat his chickens." The Entry of Louis XI into Paris. – Facsimile of a Miniature in the "Chroniques" of Monstrelet, Manuscript of the Fifteenth Century (Imperial Library of Paris). In 1461, Louis learned that his father was dying. He hurried to Reims to be crowned, in case his brother, Charles, Duke of Berry, should try to do the same. Louis XI became King of France on 25 July 1461. Louis pursued many of the same goals that his father had, such as limiting the powers of the dukes and barons of France, with consistently greater success. Among other initiatives, Louis instituted reforms to make the tax system more efficient. He suppressed many of his former co-conspirators, who had thought him their friend, and he appointed to government service many men of no rank, but who had shown promising talent. He particularly favored the associates of the great French merchant, Jacques Coeur. He also allowed enterprising nobles to engage in trade without losing their privileges of nobility. He eliminated offices within the government bureaucracy, and increased the demand on other offices within the government in order to promote efficiency. Louis spent a large part of his kingship on the road. Travelling from town to town in his kingdom, Louis would surprise local officials, investigate local governments, establish fairs, and promote trade regulations. Perhaps the most significant contribution of Louis XI to the organization of the modern state of France was his development of the system of royal postal roads. In this system, relays at instant service to the king operated on all the high roads of France; this communications network spread all across France and led to the king gaining the nickname, the "Universal Spider". As king, Louis became extremely prudent fiscally, whereas he had previously been lavish and extravagant. He wore rough and simple clothes and mixed with ordinary people and merchants. A candid account of some of his activities is recorded by the courtier Philippe de Commines in his memoirs of the period. Louis made a habit of surrounding himself with valuable advisers of humble origins, such as Commines himself, Olivier Le Daim, Louis Tristan L'Hermite, and Jean Balue. Louis was anxious to speed up everything, transform everything, and build his own new world. In recognition of all the changes that Louis XI made to the government of France, he has the reputation of a leading "civil reformer" in French history, and his reforms were in the interests of the rising trading and mercantile classes that would later become the bourgeoisie classes of France. Louis XI also involved himself in the affairs of the Church in France. In October 1461, Louis abolished the Pragmatic Sanction that his father had instituted in 1438 to establish a French Gallican Church free of the controls of the popes in Rome. Philip III was the Duke of Burgundy at the time that Louis came to the throne, and was keen to initiate a Crusade to the Holy Lands. However, he needed funds to organize such an enterprise. Louis XI gave him 400,000 gold crowns for the Crusade in exchange for a number of territories, including Picardy and Amiens. 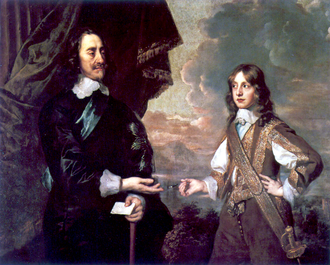 However, Philip's son, the future Charles I, Duke of Burgundy (known as the Count of Charolais at the time of Louis's accession) was angry about this transaction, feeling that he was being deprived of his inheritance. He joined a rebellion called the League of the Public Weal, led by Louis's brother Charles, the Duke of Berry. Although the rebels were largely unsuccessful in battle, Louis had no better luck. Louis XI fought an indecisive battle against the rebels at Montlhéry and was forced to grant an unfavourable peace as a matter of political expediency. When the Count of Charolais became Duke of Burgundy in 1467 as Charles I ("the Bold"), he seriously considered declaring an independent kingdom of his own. However, Louis's progress toward a strong centralized government had advanced to the point where the dukes of Burgundy could no longer act as independently as they had in the past. The duchy now faced many problems and revolts in its territories, especially from the people of Liège, who conducted the Liège Wars against the Duke of Burgundy. In the Liège Wars, Louis XI allied himself at first with the people of Liège. 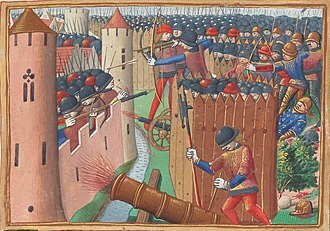 In 1468, Louis and Charles met at Péronne, but during the course of negotiations, they learned that the citizens of Liège had again risen up against Charles and killed the Burgundian governor. Charles was furious. Philippe de Commines, at that time in the service of the duke of Burgundy, had to calm him down with the help of the duke's other advisors for fear that he might hit the king. Louis was forced into a humiliating treaty. He gave up many of the lands he had acquired from Philip the Good, turned on his erstwhile allies in Liege and swore to help Charles put down the uprising in Liege. 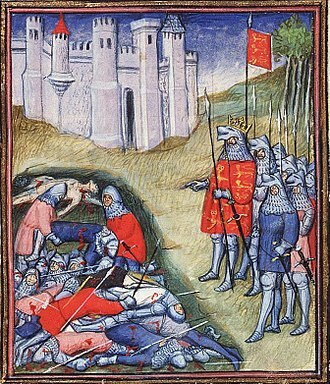 Louis then witnessed a siege of Liège in which hundreds were massacred. However, once out of Charles's reach, Louis declared the treaty invalid, and set about building up his forces. His aim was to destroy Burgundy once and for all. Nothing was more odious to Louis' dream of a centralized monarchy than the existence of an over-mighty vassal such as the Duke of Burgundy. War broke out in 1472. Duke Charles laid siege to Beauvais and other towns. However, these sieges proved unsuccessful; the Siege of Beauvais was lifted on 22 July 1472, and Charles finally sued for peace. Philippe de Commines was then welcomed into the service of King Louis. 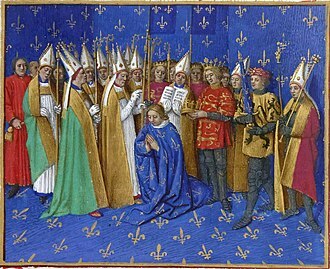 In 1469, Louis founded the Order of St. Michael, probably in imitation of the prestigious Burgundian Order of the Golden Fleece, founded by Charles' father Philip the Good, just as King John II of France had founded the now defunct Order of the Star in imitation of the Order of the Garter of King Edward III of England. In both cases, a French king appears to have been motivated to found an order of chivalry to increase the prestige of the French royal court by the example of his chief political adversary. 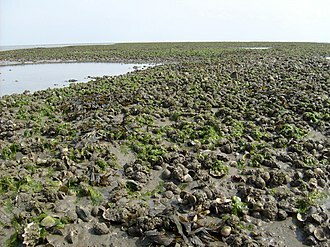 At the same time that France and Burgundy were fighting each other, England was experiencing a bitter civil conflict known as the Wars of the Roses. Louis had an interest in this war, for the Duke of Burgundy, Charles the Bold, was allied with the Yorkists who opposed King Henry VI. When the Earl of Warwick fell out with the Yorkist King Edward IV, after helping Edward attain his throne, Louis granted Warwick refuge in France. Through Louis's diplomacy, Warwick then formed an alliance with his bitter enemy Margaret of Anjou in order to restore her husband Henry VI to the throne. The plan worked, and Edward was forced into exile, but he later returned to England. Warwick was then killed at the Battle of Barnet in 1471. King Henry VI was soon murdered afterwards. Now the undisputed master of England, Edward invaded France in 1475, but Louis was able to negotiate the Treaty of Picquigny, by which the English army left France in return for a large sum of money. The English renounced their claim to French lands such as Normandy, and the Hundred Years' War could be said to be finally over. Louis bragged that although his father had driven the English out by force of arms, he had driven them out by force of pâté, venison, and good French wine. Just as his father had done, Louis spent most of his reign dealing with political disputes with the reigning Duke of Burgundy, and for this purpose he employed the Swiss, whose military might was renowned. He had admired it himself at the Battle of St. Jakob an der Birs. War broke out between Charles and the Swiss after he invaded Switzerland. The invasion proved to be a tremendous mistake. On 2 March 1476, the Swiss attacked and defeated the Burgundians at Grandson. The duke was killed at the Battle of Nancy on 5 January 1477, an event that marked the end of the Burgundian Wars. Louis thus was able to see the destruction of his sworn enemy. Other lords who still favored the feudal system gave in to his authority. Still others, such as Jacques d'Armagnac, Duke of Nemours, were executed. The lands belonging to the Duchy of Burgundy as constituted by Louis's great-great-grandfather John II for the benefit of his son Philip the Bold reverted to the crown of France. As noted above, the marriage on 14 February 1451 between Louis and the eight year-old Charlotte of Savoy was the true beginning of French involvement in the affairs of Italy. The Italian peninsula was a tightly compacted and politically competitive space dominated by five powers: Venice, Milan, Florence, the Papacy, and the Kingdom of Naples. Beside these five great regional powers, there were about a dozen smaller states in Italy that were constantly changing policies and shifting alliances between and towards the various regional powers. 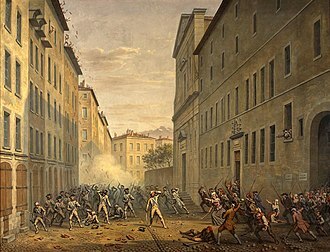 The city/state of Genoa and the rising state of Savoy, which centered on the city of Turin, were examples of these lesser powers in northern Italy. 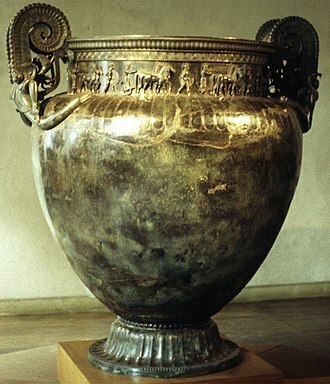 Even the Italic League – the combination of the five major powers of Italy that had been born out of the Treaty of Lodi of 1454 – was constantly undergoing internal realignments. Both Louis XI and his father Charles VII had been too busy with their struggles with Burgundy to pay much attention to political affairs smoldering in Italy. Additionally, Louis had his attention drawn away from Italy by disagreements with the rulers of England and his struggles with Maximilian of Austria, who married the sole surviving heir of Charles the Bold, Mary of Burgundy, and wanted to keep her territorial inheritance intact. However, the death of the Duke of Burgundy in 1477, which conclusively settled the issue of Burgundy's position under the French throne, the conclusion of the Treaty of Picquigny with England in 1475 and the peaceful resolution in 1482 of the disposition of the "Burgundian inheritance" left to Mary of Burgundy finally allowed Louis XI to turn his attention to Italy. Viewed from the Italian states, the death of the Duke of Burgundy in 1477 and the resultant downfall of his duchy as a threat to the French throne signalled vast changes in the states' relationships with the kingdom of France. 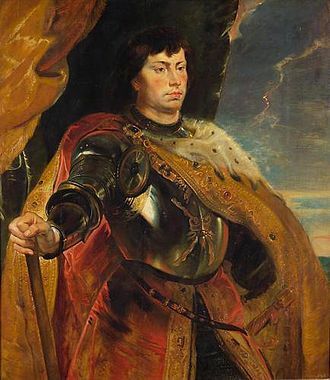 Despite his connection by marriage to the royal house of Savoy, Louis XI continuously courted a strong relationship with Francesco I Sforza, the Duke of Milan, who was a traditional enemy of Savoy. As a confirmation of the close relationship between Milan and the king of France, Sforza sent his son Galeazzo Maria Sforza to aid Louis XI in his war against the League of Public Weal in 1465 at the head of a large army. Later, differences arose between France and Milan that caused Milan to seek ways of separating itself from dependence on the French. However, with the downfall of Burgundy in 1477, France was seen in a new light by Milan, which now hurriedly repaired its relationship with Louis XI. Likewise, France's old enemy King Ferdinand I of Naples began to seek a marriage alliance between the Kingdom of Naples and France. Louis XI also opened new friendly relations with the Papal States, forgetting the past devotion of the popes for the Duke of Burgundy. In January 1478, Louis XI also signed a favorable treaty with the Republic of Venice. French involvement in the affairs of Italy would be carried to new levels by Louis XI's son Charles VIII in 1493, when he answered an appeal for help from Ludovico Sforza, the younger son of Francesco Sforza, that lead to an invasion of Italy. This would become a significant turning point in Italian political history. Louis XI died in August 1483 and was interred in the Basilica of Notre-Dame de Cléry in Cléry-Saint-André in the Arrondissement of Orléans. His wife Charlotte died a few months later, and is interred with him. Louis XI was succeeded by his son Charles VIII, who was thirteen years of age. His eldest daughter Anne of France became regent on his behalf. 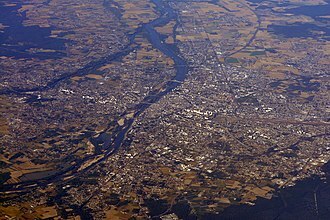 Louis developed his kingdom by encouraging trade fairs and the building and maintenance of roads. 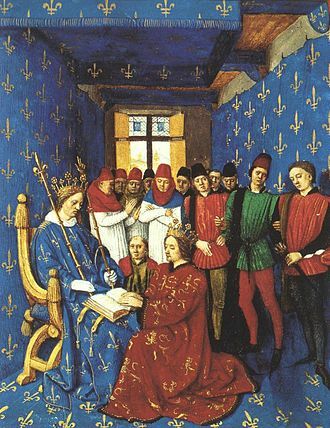 Louis XI pursued the organization of the kingdom of France with the assistance of bourgeois officials. In some respects, Louis XI perfected the framework of the modern French Government which was to last until the French Revolution. Thus, Louis XI is one of the first modern kings of France who helped take it out of the Middle Ages. Louis XI was very superstitious and surrounded himself with astrologers. Interested in science, he once pardoned a man sentenced to death on condition that he serve as a guinea pig for a gallstone operation. Through wars and guile, Louis XI overcame France's mostly independent feudal lords, and at the time of his death in the Château de Plessis-lez-Tours, he had united France and laid the foundations of a strong monarchy. He was, however, a secretive, reclusive man, and few mourned his death. Despite Louis XI's political acumen and overall policy of Realpolitik, Niccolò Machiavelli criticized him harshly in Chapter 13 of The Prince, calling him shortsighted and imprudent for abolishing his own infantry in favor of Swiss mercenaries. Anne (3 April 1461 − 14 November 1522), who became Duchess of Bourbon. Joan (23 April 1464 – 4 February 1505), who became Queen of France. Louis XI is a central character in Sir Walter Scott's 1823 novel Quentin Durward, where he is presented as an utter villain, who fatally undermined "the knightly code of chivalry", "ridiculed and abandoned the self-denying principles in which the young knight was instructed" and "did his utmost to corrupt our ideas of honour at the very source". In the opinion of Scott, inspired by the 19th-century Romanticism, Louis XI's being "purely selfish" and concerned solely with "his ambition, covetousness and desire of selfish enjoyment" merited his being considered "almost an incarnation of the devil himself", comparable to Goethe's Mephistopheles. Coincidentally, Sir Henry Irving had long-running stage successes playing both Louis XI and Mephistopheles. Conversely, Balzac gives a plausible and somewhat favourable picture of the king in his story "Master Cornelius". Louis XI appears as a character in several film versions of the stage melodrama If I Were King, a fictitious play about real-life poet François Villon. He appears in the operetta The Vagabond King, which is based on If I Were King. He is an important character in Victor Hugo's classic novel The Hunchback of Notre Dame as well as in most of its film adaptations. Louis XI is depicted in the French silent film (1924) The Miracle of the Wolves (Le Miracle des loups) and the 1961 remake. He appears in the film Yolanda (1924), based on a novel by Charles Major. Among the actors who have played him onscreen are Robert Morley, Basil Rathbone, Conrad Veidt, Jean-Louis Barrault, Harry Davenport, Holbrook Blinn, Walter Hampden, Charles Dullin, and O. P. Heggie. In addition, Louis XI is a minor character in the play Henry VI, Part 3, by William Shakespeare, where he is stylised as Lewis; he is depicted as, after choosing to support the Yorkist faction, switching allegiance to the Lancastrians, led by Margaret, following Edward IV's refusal to marry a French noblewoman. A character called the Spider King in Christopher Stasheff's 1994 novel The Witch Doctor goes by different names in different worlds, one of which being Louis XI. Laurence Schoonover's 1954 novel "The Spider King" is a "biographical novel of Louis XI of France." ^ Kendall, Paul Murray. Louis XI: The Universal Spider, (New York: W.W. Norton & Company Inc., 1971), p. 33. ^ Guérard, Albert. France: A Modern History. (Ann Arbor, Michigan: University of Michigan Press, 1959), p. 552 Note 3. ^ a b Kendall. 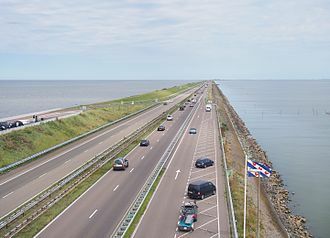 p. 34. ^ Paul Murray Kendall, Louis XI: The Universal Spider, p. 84. ^ a b Kendall, p. 42. ^ Albert Châtelet and Jacques Paviot, Visages d'antan : le Recueil d'Arras (XIVe-XVIe siècle), Lathuile, Éditions du Gui, 2007 (ISBN 978-2-9517417-6-8 et 2-9517417-6-6), pp. 401, 410. ^ Moreau, Gilles-Marie. Le Saint-Denis des Dauphins: histoire de la collégiale Saint-André de Grenoble. L'Harmattan, Paris, 2010. ^ Paul Murray Kendall, Louis XI: The Universal Spider, p. 107. ^ a b c d e Paul Murray Kendall, Louis XI, the Universal Spider, p. 116. ^ Paul Murray Kendall, Louis XI: The Universal Spider, p. 115. ^ Paul Murray Kendall, Louis XI: The Universal Spider, p. 118. ^ a b c d Albert Geurard, France: A Modern History, p. 116. ^ Paul Murray Kendall, Louis XI: The Universal Spider, p. 117. ^ Paul Murray Kendall, Louis XI: The Universal Spider, p. 121. ^ Paul Murray Kendall, Louis XI: The Universal Spider, p. 142. ^ Paul Murray Kendall, Louis XI: The Universal Spider, pp. 158–168. ^ Paul Murray Kendall, Louis XI: The Universal Spider, p. 169. ^ Paul Murray Kendall, Louis XI: The Universal Spider, p. 214. ^ Paul Murray Kendall, Louis XI: The Universal Spider, pp. 222–223. ^ Paul Murray Kendall, Louis XI: the Universal Spider, p. 250. ^ a b Paul Murray Kendall, Louis XI: The Universal Spider, p. 241. ^ Paul Murray Kendall, Louis XI: The Universal Spider, p. 276. ^ Albert Guérard, France: A Modern History, p. 117. ^ Paul Murray Kendall, Louis XI: The Universal Spider, p. 298. ^ Paul Murray Kendall, Louis XI: The Universal Spider, p. 300. ^ Paul Murray Kendall, Louis XI: The Universal Spider, p. 314. ^ Paul Murray Kendall, Louis XI: The Universal Spider, p. 333. ^ a b c d Paul Murray Kendall, Louis XI: The Universal Spider, p. 334. ^ Albert Guérard, France: A Modern History, pp. 117–118. ^ Paul Murray Kendall, Louis XI: The Universal Spider, p. 323. ^ Paul Murray Kendall, Louis XI: The Universal Spider, p. 147. ^ Robert S. Hoyt and Stanley Chodorow, Europe in the Middle Ages (New York: Harcourt, Brace, Jovanovich, Inc., 1976) p. 619. ^ Douglas Brine, Pious Memories: The Wall-Mounted Memorial in the Burgundian Netherlands, (Brill, 2015), 68. ^ Bowersock, G W (2009). From Gibbon to Auden : Essays on the Classical Tradition. Oxford, UK: Oxford University Press. p. 64. ISBN 9780199704071. ^ "Movie Review - - THE SCREEN - NYTimes.com By MORDAUNT HALL. Published: February 24, 1925". www.nytimes.com. February 24, 1925. Retrieved 2017-08-20. ^ "Charles Dullin". IMDb. Retrieved 2017-08-19. ^ "The Witch Doctor : Home". Christopher.stasheff.com. Archived from the original on 10 November 2013. Retrieved 10 November 2013. The Treaty of Picquigny was a peace treaty negotiated on 29 August 1475 between the Kingdom of England and the Kingdom of France. It followed from an invasion of France by Edward IV of England in alliance with Burgundy and it left Louis XI of France free to deal with the threat posed by Charles the Bold, Duke of Burgundy. Edward IV had invaded France in alliance with Charles the Bold, Duke of Burgundy, the plan was to march through Burgundian territory to Reims. However Charles failed to provide the support he had promised, Edward received little support from his other ally Francis II, Duke of Brittany. Louis sent Edward word that he was willing to offer more than Edwards allies could and he induced Edward to negotiate a settlement. The two negotiated by meeting on a bridge with a wooden grill-barrier between the sides, at Picquigny, just outside Amiens. The negotiations led to an agreement signed on 29 August 1475, the two kings agreed to a seven-year truce and free-trade between the two countries. Louis XI was to pay Edward IV75,000 crowns upfront, essentially a bribe to return to England and he would receive a yearly pension thereafter of 50,000 crowns. Also the King of France was to ransom the deposed Queen Margaret of Anjou and it included pensions to many of Edwards lords. Other provisions of the treaty were that if either king experienced a rebellion, Edwards daughter Elizabeth of York was to marry the Dauphin Charles when she came of age. 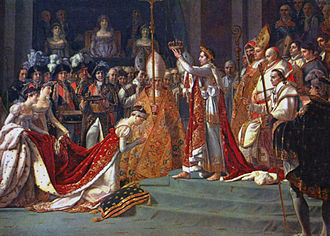 The English claim to the French throne was to be subject to arbitration along with disagreements between the monarchs. A committee should meet annually to discuss the issues and their conclusions should be binding and it was to comprise the archbishops of Canterbury and Lyons, Edwards brother George, the Duke of Clarence, and Louis, Count of Dunois. In addition to the king, his leading advisors received pensions from the French, Thomas Rotherham the chancellor had 1,000 crowns a year. John Morton had 600 crowns, and Sir John Howard and Sir Thomas Montgomery 1,200 each, william Hastings, 1st Baron Hastings, who had been the chief advocate for the treaty, was to receive 2,000 crowns a year. Charles the Bold, baptised Charles Martin, was Duke of Burgundy from 1467 to 1477. He was the last Duke of Burgundy from the House of Valois and is known as Charles the Rash. His early death at the Battle of Nancy at the hands of Swiss mercenaries fighting for René II, Charles the Bold was born in Dijon, the son of Philip the Good and Isabella of Portugal. Before the death of his father in 1467, he bore the title of Count of Charolais, afterwards, he assumed all of his fathers titles, including that of Grand Duke of the West. He was made a Knight of the Golden Fleece just twenty days after his birth, invested by Charles I, Count of Nevers, Charles was brought up under the direction of Jean dAuxy and early showed great application alike to academic studies and warlike exercises. His fathers court was the most extravagant in Europe at the time, in 1440, at the age of seven, Charles was married to Catherine, daughter of King Charles VII of France and sister of the Dauphin. She was five years older than her husband, and she died in 1446 at the age of 18, in 1454, at the age of 21, Charles married a second time. He wanted to marry a daughter of his distant cousin Richard Plantagenet, 3rd Duke of York and his father chose Isabella of Bourbon, who was three years younger than he was. Isabella was the daughter of Philip the Goods sister Agnes and a distant cousin of Charles VII of France. Their daughter Mary of Burgundy was Charles only surviving child, she inherited all the Burgundian domains before her marriage to Maximilian of Hapsburg, the son of Holy Roman Emperor Frederick III. Charles was on terms with his brother-in-law Louis, the Dauphin of France. For his third wife, Charles was offered the hand of Louis XIs daughter Anne, the wife he ultimately chose, was his second cousin Margaret of York. 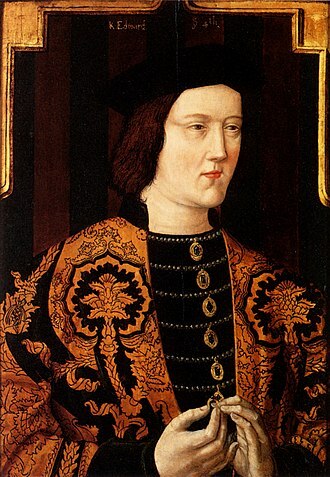 Upon the death of his father in 1467, Charles was no longer bound by the terms of the Treaty of Arras, and he decided to ally himself with Burgundys old ally England. Louis did his best to prevent or delay the marriage with Margaret, but in the summer of 1468, it was celebrated sumptuously at Bruges, the couple had no children, but Margaret devoted herself to her stepdaughter Mary. Bourges Cathedral is a Roman Catholic church located in Bourges, France. It is dedicated to Saint Stephen, and is the seat of the Archbishop of Bourges, the present Cathedral was built as a replacement for a mid-11th-century structure, traces of which survive in the crypt. The date when construction began is unknown, although a document of 1195 recording expenditure on rebuilding works suggests that construction was underway by that date. The main phase of construction is therefore roughly contemporaneous with Chartres Cathedral, as with most Early- and High-Gothic cathedrals, the identity of the architect or master-mason is unknown. The choir was in use by 1214 and the nave was finished by 1255, the building was finally consecrated in 1324. Most of the west façade was finished by 1270, though work on the towers proceeded more slowly, partly due to the rock strata beneath the site. Structural problems with the South tower led to the building of the adjoining buttress tower in the mid-14th century, the North tower was completed around the end of the 15th century but collapsed in 1506, destroying the Northern portion of the façade in the process. The North tower and its portal were subsequently rebuilt in a contemporary style. Generally the cathedral suffered far less than some of its peers during the French Wars of Religion and its location meant it was relatively safe from the ravages of both World Wars. The cathedral was added to the list of the World Heritage Sites by UNESCO in 1992, Bourges Cathedral covers a surface of 5,900 square meters. The cathedrals nave is 15 m wide by 37m high, its arcade is 20m high, the aisle is 21.3 m. The use of flying buttresses was employed to help the structure of the building, since this was a fairly new technique, one can easily see the walls were still made quite thick to take the force. Sexpartite vaults are used to span the nave, the double aisles continue without interruption beyond the position of the screen to form a double ambulatory around the choir. This design, with its distinctive cross section, was subsequently copied at Toledo Cathedral. The flying buttresses surrounding the cathedral are relatively slender and efficient, particularly compared to the contemporary and their steep angle helps to channel the thrust from the nave vaults and the wind loading on the roof to the outer buttress piers more effectively. 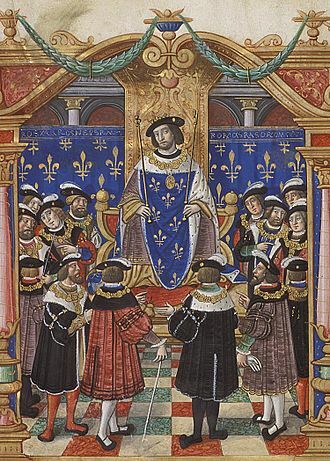 King Francis I presiding the Order's knights.Painting from a copy of the statutes from about 1530.